ELMHURST — A neglected Queens plaza is ready for a facelift — including new greenery, furniture and a performance area — thanks to a community-involved plan sponsored by a local Elmhurst and Jackson Heights business improvement district. After soliciting survey responses from 130 people on 82nd Street, both in Spanish and in English, the 82nd Street Partnership will present plans to the Parks Department later this month to revamp Dunningham Triangle — one of the final steps in completing a $200,000 park makeover, according to partnership director Seth Taylor. "The activity and amenities that we're envisioning we think will be great for the 82nd Street corridor," Taylor said. "There's a good deal of input from the surrounding businesses and restaurants, there were children and elderly people involved — it's a really diverse group of stakeholders." The group set up a series of "visioning days" this fall where members of the community chose what they believed were important characteristics for their new park. Answers included live music, free Wi-Fi, brighter lights and board games. 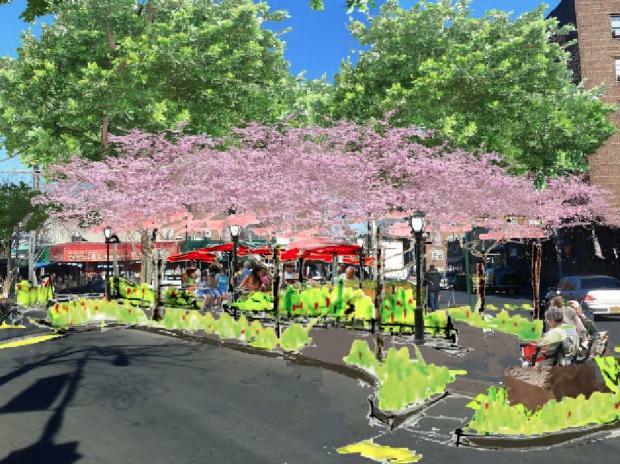 Paid for with $50,000 in mayoral funds and $150,000 from the borough president's office, the revitalization would include new foliage, removable tables and chairs, umbrellas, gardens and a performance area, according to the renderings. The community also had the opportunity to weigh in at the Viva La Comida! festival, a street festival outside the triangle in September featuring local music, food, dancing and art. After this month's presentation, the city will provide feedback and work with the group on the scope and timeline of the plan, Taylor said. The plan resembles similar projects that have been presented across the five boroughs, he said, something the director believes works in its favor. And thanks to the community's input, Taylor believes the community has also put together a design that reflects the neighborhood's needs. "The community came up with ideas that seem to be in line with [what parks is] doing with other plazas and public spaces throughout the community," Taylor said. "We're using their toolkit — seating, planting strips, lighting — these common park elements you see in other public spaces around the city. "It's a plan that can be realized," he added.